Drape Coat: Forever21 [old, similar style] | Jeans: Dynamite | Booties: indigo rd. I’m continuing my obsession with one of this season’s biggest trends: fringe. I continue to gravitate towards it and don’t see myself stopping any time soon. I teamed up with indigo rd. to style a pair of my favorite booties for fall so it’s no surprise that I chose these! Their collection is all about the desire to wander and discover. They all have such a laid back aesthetic for the free spirited girl. How fitting for me, especially since I leave for Ireland in a few hours! I think the best part about booties in general is the fact that they’re seriously so versatile and styling options are pretty much endless. The low chunky heel makes these much more casual and comfortable. They would still look great paired with a skirt or dress for more of a chic look though. 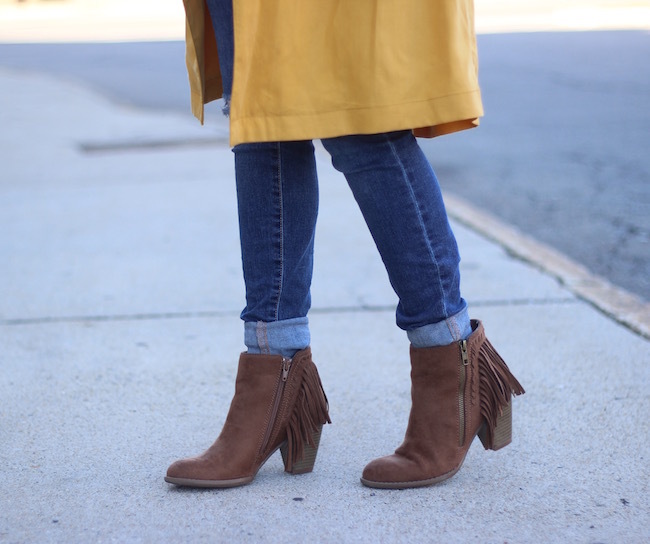 Fringe booties definitely give off a western and adventurous vibe, which I like. These are a statement shoe for sure and a nice way to make the simplest of outfits stand out. When it came to putting this look together, I just instantly thought of pairing mustard and leopard print. I absolutely love that combination and thought these booties would be the perfect finishing touch. I’ve worn this coat several times before, but always with pumps or knee high boots. I wanted to switch things up and loved the idea of wearing them with the fringe. I love how it all came together. Make sure to check out all of the other indigo rd. shoes! I think that there is something for everyone. Also, you can share a photo of your favorite fall #OOTD on Instagram using #FringeForFall and #IndigoRd for a change to win a pair of indigo rd. fringe booties! This post was sponsored by Indigo Rd. All opinions are my own and this was not edited by any third parties. Thanks for supporting the brands that support A Love Affair With Fashion! What a great coat! I never would have thought mustard yellow could be so flattering. You totally rocking this whole look! Great coat, works perfectly with the leopard scarf! Such a cute look! Love it..have a safe flight and an amazing journey in Ireland! Beautiful mustard color. It looks great on you. I like that you cuffed the jeans. Most people are wearing the distressed jean with stilettos and this is a refreshing change. As usual, you look adorable!